Im taking Adrenal Response with other thyroid vitamins to redeem my energy. Supports a healthy stress response! The key botanical in Adrenal Response is Sensoril®. Sensoril is an extraordinary extract of the revered Ayurvedic botanical‚ Ashwagandha (Withania somnifera). Sensoril is produced from the roots of plants less than two years old‚ using a water-based process that guarantees optimal concentrations of several key constituents. These constituents include: Withanolide glycosides‚ oligosaccharides and withaferin-A in concentrations clinically shown in double-blind‚ placebo-controlled clinical trials‚ to support a healthy response to stress and help to ward off fatigue. Organic Amla Fruit (Phyllanthus emblica)‚ Organic Kelp Fonds (Laminaria digitata)‚ Kelp. Other Ingredients: Rice bran‚ silica‚ stearic acid‚ guar gum‚ cellulose. Non-GMO / Gluten-Free / Vegetarian / Kosher / Dairy-Free / Soy-Free. 2 tablets daily‚ or as directed by a healthcare practitioner. May be taken anytime throughout the day‚ even on an empty stomach. If pregnant‚ nursing‚ or you have a medical condition‚ consult your healthcare practitioner before taking this product. I have been taking Adrenal Response by Innate Response Formulas, mostly for PMDD, which makes me feel anxious and rundown. I have had some success with Siberian Ginseng, another adaptogen, and this blend of adaptogens seems to also provide an improved overall sense of well-being. I got Adrenal Response by Innate Response Formulas for myself, talked my husband into taking it and he loves it to It has made such a big difference in our energy levels! I finally found one that works! Adaptogens are recommended for those healing from adrenal fatigue. I have tried several products that either were too strong or too weak for me. 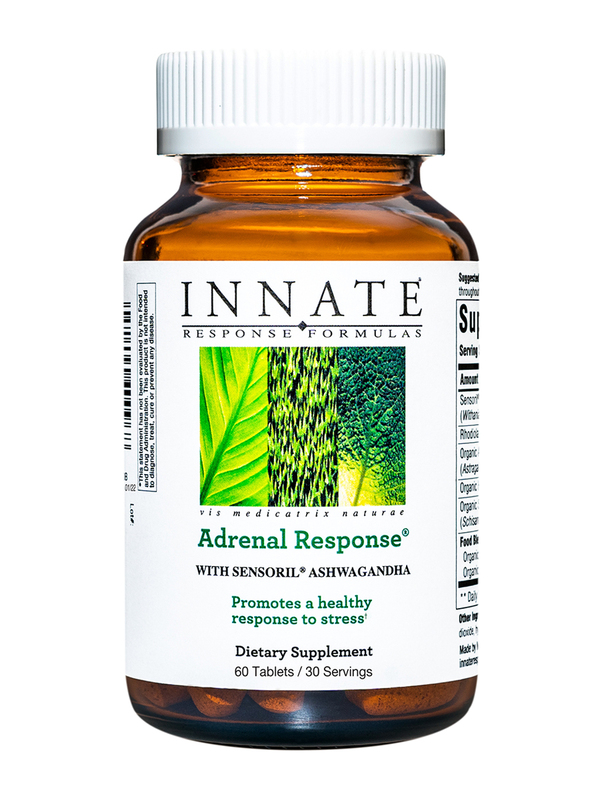 I am thrilled about this Adrenal Response by Innate Response Formulas product. I received a sample of this and it worked with the first dose. I handle everyday, steer better, and find that sleep is easier. Adrenal Response by Innate Response Formulas was recommended by my physician. Only supplement that works for me for my health problem. This works for me. It is of great quality. Adrenal Response by Innate Response Formulas has been very helpful for me on days when I need an extra boost of energy. I definitely feel a difference when I take this in the morning. I have had nothing but good experiences from PureFormulas their prices are fair and shipping is quick and accurate. I would highly recommend this product. It makes a difference in my health and energy level. I wish you got more for the price, but it's still worth it! I feel a notable difference in energy when I take Adrenal Response by Innate Response Formulas. This is a great product for anyone suffering from adrenal fatigue. Adrenal Response® by Innate Response Formulas arrived fast, that was a biggie for me. It's a quality product for the price which was a little steep but worth it. The product really help me get my energy up. I take it in the morning when I'm feeling groggy and it wakes me up so I'm not laying around for the rest of my day. It also has a calming affect, I feel less anxiety and stress. Good stuff and I found I don't need it everyday so I don't use them up quickly. I take them when I need a pick me up and works great. Will continue to purchase them. Forgot to add the pills are a great size so choking on them is not a problem. Size, quality, and they work! Adrenal Response® by Innate Response Formulas works very well. I've tried other brands and formulas, but this worked best for me. I needed to take it for a few days before really recognizing the effect. I began sleeping better and felt more balanced in terms of moodiness during the day. First one that has actually worked for me. Prolonged use (more than three weeks) brought on grogginess. My naturopath recommended Adrenal Response by Innate Response Formulas for me, and it really it helps. I have more energy and overall feel better.